One of the things I like about photography overall is how one thing can lead to another. One day sitting at work I got a friend request from Zara Ashby. I didn’t know Zara personally at the time but I had seen some of her work and was always impressed. As we started started talking we set up a time to meet in person. It’s always great to meet another artist who is a photographer and talk some about the things we enjoy doing. Near the end of our time together, Zara mentioned that she had worked with a model named Hillary Ingalls. I had seen some of Hillary’s work with other photographers and had always felt she’d be fun to work with. Zara agreed to introduce me and that’s how a simple friend request led to a whole other photo shoot. Hillary has some very classic features but she was also open to doing something a little darker. I had this idea that I wanted to do a shoot featuring a woman who was very put together slowly descending into darkness and maybe even madness. Why? I have no idea…it just seemed like a good idea at the time. One thing I loved about Hillary was that she was totally willing to try and anything I asked so when I floated this idea past her she was totally open to it. I recruited Christine Bartai for wardrobe and of course I asked Kristopher Osuna to help with the make up and hair duties. Once the idea had taken root, I couldn’t get it out of mind. So I reached out to Paul Weir and Karel Moonen who both work with Many Mouths One Stomach – the group that puts on the All Souls Procession. I’ve been a part of that media team for several years now and I knew that they coordinates all of the pyrotechnics for the finale. I was thrilled when Karel agreed to come along on the shoot and be our fire safety officer and teach us how to use the flares safely. With the flares nailed down I felt like if nothing else we were going to get some interesting photos. Paul and Karel both warned me that I should probably save the flare shots for the end since there was a good chance that we had have law enforcement show up wanting to know what was happening. On the day of the shoot we decided to do it in two parts. We’d photograph in the studio during the hottest part of the day. Later in the afternoon, we’d drive down to the warehouse and shoot in the late afternoon sun. It went great. Hillary was a lot of fun to work with and a very graceful and accomplished model so the studio part by very easily and was a lot of fun. We got into that groove that I love where everybody is working together that the creation process is almost effortless. We finally called the studio part done and headed to the warehouse. Once we arrived we setup the antique couch (thank you Cynthia Locke) we brought and to get warmed up I shot a few photos of Hillary on location with and without light. Once we finished off that part of the shoot it was time to start the descent into madness. This is where Kris excels and after a quick makeup and wardrobe reset we started shooting photos of a distinctly different Hillary – one that make anyone worried should they have seen her. FInally it was time for the big finale, I setup the camera on a tripod and we started lighting flares. 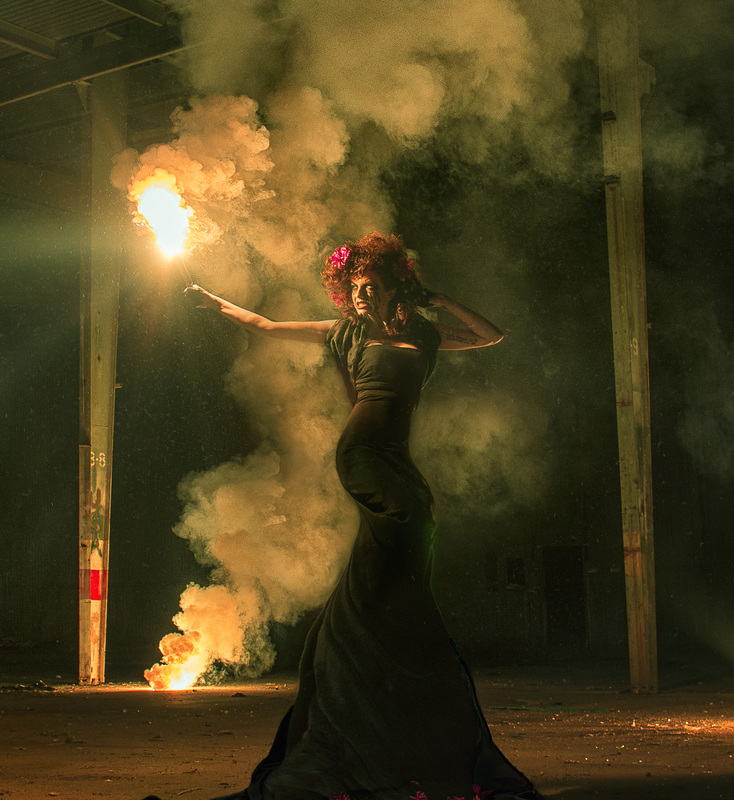 It took a little bit of experimentation to get the light and the placement of the flares right but I was thrilled with the final effect of this beautiful, crazy woman holding a flare burning and the smoke from the others billowing in the background. 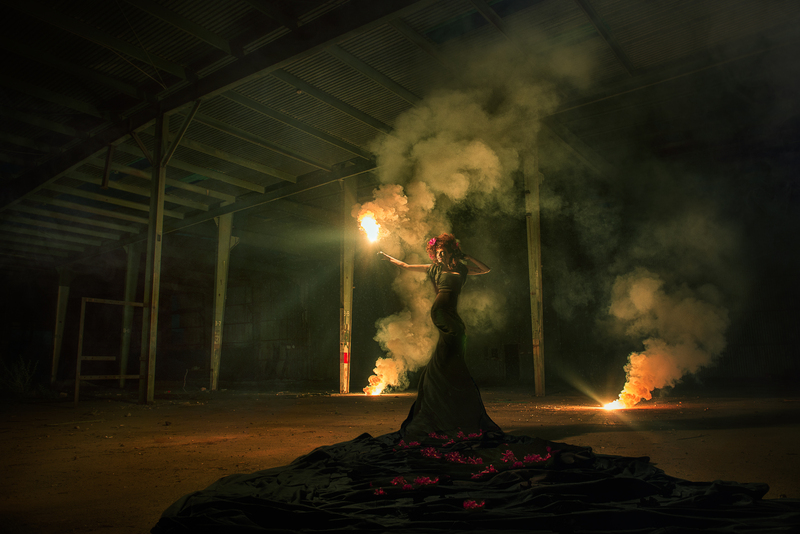 Turns out I was not the only one who loved the idea of flares being fired in abandoned warehouse. Right on que three Sheriffs showed up to see what was going. They were incredibly polite but firm that we were going to have to wrap things up and move on. My son managed to grab a photo with his cell phone which was funny – but I’ve included it as well. We had planned on this and except for some last minute packing we were pretty much to vacate the premises and reconvene for dinner at a restaurant and to revisit our venture. It was a great adventure and I would love to do something like it again. It was incredibly gratifying to have 3 of the images of this series featured by Dark Beauty Magazine’s Facebook page.